Colleen T. Fogarty, M.D., M.Sc. Dr. Fogarty is a Family Physician who practices full spectrum care for children and adults at Highland Family Medicine in Rochester NY. A community health center "lifer", she enjoys the diversity of the patients and families she sees at the health center and plays an active role in teaching Family Medicine residents training there. 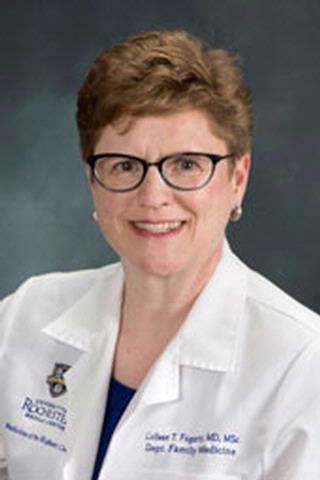 When not seeing patients, Dr. Fogarty works with fellows and residents at the University of Rochester/Highland Hospital Department of Family Medicine, where she serves as the Associate Chair and Medical Director of Highland Family Medicine. Dr. Fogarty earned her medical degree at the University of Connecticut School of Medicine and completed residency in Family Medicine at the University of Rochester. She has additional training in Family Systems from the University of Rochester and a Master of Science in Epidemiology and Biostatistics from the Boston University School of Public Health. Her special clinical interests include working with patients coping with post-trauma symptoms, women's health, and caring for young children. Dr. Fogarty is the Associate Chair and Medical Director at Highland Family Medicine with the University of Rochester/Highland Hospital Department of Family Medicine. She earned her medical degree at the University of Connecticut School of Medicine and completed residency at the University of Rochester. Dr Fogarty has additional training in Family Systems from the University of Rochester and a Master of Science in Epidemiology and Biostatistics from the Boston University School of Public Health. A community health center "lifer" she has worked at CHC's in rural Michigan, rural and urban western New York, and South Boston. She now provides care for patients and families at Highland Family Medicine, the site of her residency practice. Dr. Fogarty's publication record includes both empirical and creative work. Her scholarship includes work in primary care identification and management of mental health conditions, intimate partner violence, and cultural humility training. Her empiric publications have appeared in Family Medicine, Preventive Medicine, The Clinical Teacher, and other journals. She currently has funding from the Gold Foundation for Humanism in Healthcare to provide training to residents and faculty in Patient Centered Communication Strategies while Using the Electronic Health Record. Dr. Fogarty is considered an expert in writing 55-word stories and using them as an educational tool for self-reflection. She has published many 55-word stories, poetry, and narrative essays in several journals, including Family Medicine, Health Affairs, Pulse Magazine, Medical Humanities, the Journal of Family Practice, and Families, Systems, and Health; She has received creative writing awards from the University of Rochester Cluster on Human Values in Healthcare and the Family Medicine Education Consortium. She practices and teaches writing 55-word stories with colleagues and residents, and edits the 55-word story column for the journal Families, Systems, and Health. Dr Fogarty was named co-editor (with Larry Mauksch) of the journal, Families, Systems, and Health in 2013. She also serves as an ad hoc reviewer for many journals, and was recently recognized as one of the "top 10%" of reviewers for The Journal of the American Board of Family Medicine. A dedicated medical educator, she has taught many topics relevant to the Patient Centered Medical Home, including team development, team huddles, and supporting patient self-management. Award Winning Essay, "This I Believe"
URMC Creative Excellence Award Essay "I just want the best for my child"
Family Medicine Education Consortium, Creative Writing Award "Could you Know?" Fogarty CT, Mauksch L. "Journal editing: Reflections on 6 years of collaborative practice." Families, systems & health : the journal of collaborative family healthcare.. 2018 Sep 0; 36(3):263-266. Fogarty CT. "Stories." Family medicine.. 2018 Mar 0; 50(3):232. Mauksch L, Fogarty CT. "Behavioral health integration and the risks of reductionism." Families, systems & health : the journal of collaborative family healthcare.. 2018 Mar 0; 36(1):1-3.